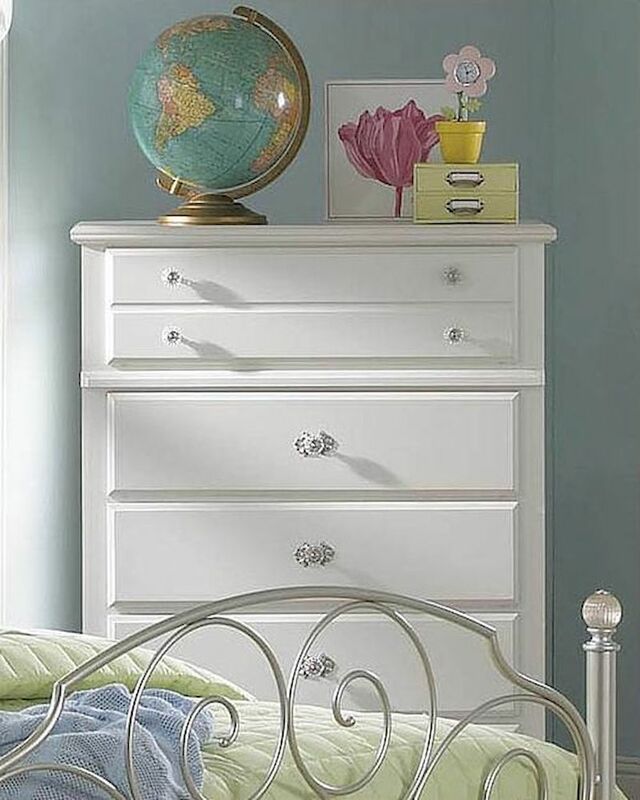 Standard Furniture Drawer Chest Spring Rose ST-50255. Spring Rose features a traditional look, inspired by classic European Victorian design. Drawer Chest - 33"W x 16"D x 48"H.
Wood products with simulated wood grain laminates and faux marble laminates. French dovetail. Roller side drawer guides. Dust proofing underneath protects items in drawers from up drafting dust. Clear colored knobs with fancy filigreed pattern back plates in a silver color finish. White pearlescent color finish creates lasting, attractive and easy-to-clean surfaces. Victorian style overlays grace every piece adding a soft and feminine feel. You could say we do things a little differently around here. We own something that no other furniture manufacturer does: the power to craft furniture that is meant to be lived with. Since 1946, we've been deep rooted in beauty, quality, functionality and affordability. 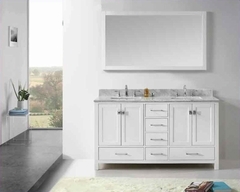 Today, we design, manufacture and deliver bedrooms, dining rooms, occasional tables and entertainment centers to over 3,000 retailers nationwide. We are a family owned and operated business with headquarters at home in Bay Minette, Alabama and plants in Frisco City, Alabama and overseas. In 2001, Standard Furniture was poised to accommodate Kathy Ireland Home to invent Kathy Ireland Home by Standard. Since then, our business families have worked together "...finding solutions for families, especially busy moms."